I had imagined the winery Ornellaia differently. When I thought of Tenuta dell ‘Ornellaia before my visit, in best case with one of the houses wines in front of me in the glass, I had something pompous in my head. In the style of french chateaus. Maybe because of the composition of the wines? But no matter – what a mythical place. Already last year I really wanted to go to Tuscany, but I could not realize it. This year it should work out. For this we made a small timetable, peppered with special wineries, across Tuscany. The first stop of the journey was Ornellaia. At solid 34 ° and a beautiful landscape with lush green and juicy berries, which are about to be harvested. Sarah had booked appointment – thank you! With respect and awe I rang seven minutes before our appointment at the ‘Visitors’ bell. If you really stand right, you realize when the gate opens. The underlying gravel path leads to two larger carports, which are not far from a flat construction. There was first a bottle of water and a short intro on the map, which gave information about the planted grape varieties. Everything is very unpretentiously, bright and almost strikingly simple. Perhaps it was the expectation, with such a name of the highest international level, that the winery would be super pretentious. But obviously they do not have to be. At the heart of the huge estate lies a low-rise building sunk into the ground, which adjoins the previous impressions. Stylish and neat, with a penchant for art. Antinori is the name. A name that has already found its way into every wine-loving persons ear. In 1980, the trip started, triggered by the purchase of land by Lodovico Antinori, who certainly had great plans. In a special location in Bolgheri and in the best company and neighborhood, the first vines were planted in 1982. Today Ornellaia earns about 100ha of vines, which are mostly planted with the French grape varieties of Cabernet Sauvignon, Merlot, Cabernet Franc and Petit Verdot. Not without a reason, as we know today. It started with the flagship, the Ornellaia, which was able to collect a lot of laurels in less than 20 years – in 1998 also awarded the best red wine in the world by the Wine Spectator. Years later the assortment was enlarged by the Le Volte and Le Serre Nuove. Today, the winery is owned by the Frescobaldi family, which has built an empire of prestigious brands and can call names like Masseto or Luce their own. Before the Frescobaldis acquired the winery in full in 2005, Californian Robert Mondavi and Constellation Brands held up to 50% of the company. Also, Ornellaia has a special connection to Germany, in the person of Axel Heinz, who the oenologist and winemaker today. He is advised by Michel Rolland, who has been in close contact with Ornellaia since the founding of Tenuta dell ‘Ornellaia. Back on site. It is clear that the focus in the given territory is on red wine. And certainly not surprising is the pursuit of perfection in the whole process of winemaking. No quick shots, everything is meticulously planned and nothing left to chance. Only in this way is it possible to live up to one’s own and someone else’s claim to the wines of Ornellaia. Soil and climate are a real blessing for the grapes and allow the highest quality of material. Maritime influence with cooling breezes in the warm summer months, the protection of the mountains in winter and a combination of different soil types offer the winemakers a base that one desires elsewhere. All grapes are hand-picked and subject to a double selection, varieties and plots are differentiated expanded. So the base wines first ripen in a small oak barrel, before they are put together after the ‘GO’ of the team. Always with a balance between the in-house philosophy and the characteristics of the respective vintage. Yes, what is Ornellaia. A winery with an impressive name and reputation and still quite short history. Here, wines are brought to the bottle, which are awarded year after year with high scores, have booked on leaderboards a permanent seat, are cost-intensive, have an enormous maturation potential like their siblings from France and carry the sun of Italy in itself. And you actually feel that sun. They have a pleasant warmth, maturity, opulence, without losing their elegance. For some there are icons that arrive in the 6er OHK and disappear for years in the cellars – admittedly, I found 2014 and 2015 after release very good to drink and 2014 still is due to the vintage – for others, there are calibrated wines that turn on Parker, Suckling and Co. to receive appropriate ratings. Fortunately, everyone decides for themselves. I’m a big fan of the wines of this house. Through the bank. From the trend-setting Le Volte, the seemingly always in the right drinking window located Le Serre Nuove and of course the great Ornellaia. When I stood in the winery on the small hill at parking lot 2 – right at the head of the entrance to the winery – I found it a special, unique place. A giant slumbering in a sea of ​​greens. Total silence and idyll. 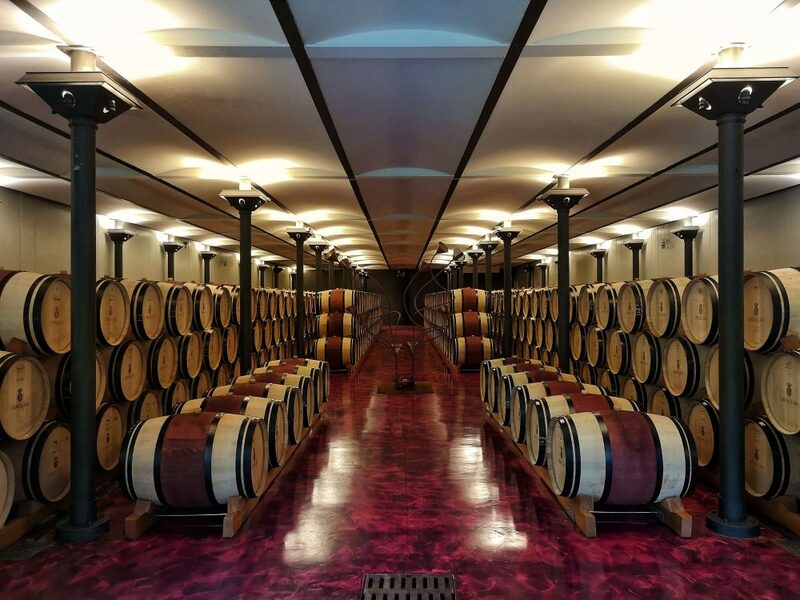 As mentioned earlier, the winery Ornellaia, together with the winery Masseto, which is also located on the property of Ornellaia, earned its reputation for world-wide by the red wines. And these reds are each year again equipped with absolute top marks of the critics. Even in rather difficult vintages, they manage to get anything out of the berries and still stand in the front row. Very exciting, I think, because in big years to bring something big on the bottle is the one thing, to master a difficult vintage the other thing. Ornellaia’s portfolio today includes five wines, three of which are red. Starting with the Poggio alle Gazze, a blend of Sauvignon Blanc, Vermentino and Viognier, in which the Sauvignon Blanc clearly dominates. A wine that lives from its ripe fruit, playing acidity and its Italian touch. A popular drop. Dominance of Sauvignon Blanc fruit, flowers and honey come to my mind immediately, if I think of the taste of the Poggio alle Gazze. Le Volte is the first red in the collection and comes as a blend of Merlot, Sangiovese and Cabernet Sauvignon. Le Volte is an early starter and, thanks to its expansion in a steel tank and some time in barrique, is accessible early and thus the perfect pastime to wait for the right drinking window for Le Serre Nuove. Le Volte lives from its freshness, the harmony and aromas of the grape varieties and its animating acidity. The Le Serre Nuove is the second growth of the house and is vinified as a classic Bordeaux blend of Merlot, Cabernet Sauvignon, Cabernet Franc and Petit Verdot. From young vineyards, the grapes are handpicked, selected several times and both the grape varieties and the plots are vinified separately. Le Serre Nuove brings strength and elegance as the little brother of the great Ornellaia. He is tight and deep in the glass and – in my experience – makes much fun after four to five years, even if he consistently develops. Here you have Tuscany in your glass. Ripe fruit, spices, the sun of Bolgheri – a timeless drop. Before it goes to the flagship, it is actually white again. With the Ornellaia Bianco, Ornellaia brings a particularly rare white wine to the bottle. We have 100% Sauvignon Blanc in Ornellaia Bianco. The nose is dominated by fruit and yeasts. The palate is not crispy and slender, rather juicy, lush and powerful. Loaded and unlocked. Enormous density, depth and length make the Bianco, which unfortunately I only had a few times on the palate, a highlight that is definitely too rare in my glass. But he is just too rare for that. Whether in the trade or on the wine list, lucky fishing! And now Curtain up, for the wine that has made this winery in such a short time a global player. The Ornellaia. The term ‘Super Tuscans’ has probably come across every wine enthusiast, and so we have to do with the Ornellaia with a THE Super Tuscan. Not only the varietal composition of Cabernet Sauvignon, Merlot, Cabernet Franc and Petit Verdot is reminiscent of Bordeaux, also its quality and shelf life. The Ornellaia is completely independent and does not need to hide behind any international Bordeaux blend. Of course, only the best grapes in perfect condition, after hand picking and very small-scale vinification in the figurehead. In Ornellaia, a huge range of flavors meet. From the ripe red fruit over tobacco and ethereal notes to its Italian, balsamic touch. The wines are balanced, profound and their structure stands in years like 2015 like the chassis of a Porsche 911. Enormous expressiveness paired with elegance and potential for many, many years. Ornellaia makes a lot of fun right after the release – in the fruit phase – and then, like many greats, makes up and lies down again. With more maturity and years on the bottle he grows up. Drinking Ornellaia is always an experience. And I’m certainly not alone with the opinion. Did you like what you read?! And maybe you know somebody who also loves the wine region of Tuscany? Then use the social share buttons on top and bottom of this page!